In Living Letters of the Law, Jeremy Cohen investigates the images of Jews and Judaism in the works of medieval Christian theologians from Augustine to Thomas Aquinas. He reveals how—and why—medieval Christianity fashioned a Jew on the basis of its reading of the Bible, and how this hermeneutically crafted Jew assumed distinctive character and power in Christian thought and culture. Augustine's doctrine of Jewish witness, which constructed the Jews so as to mandate their survival in a properly ordered Christian world, is the starting point for this illuminating study. Cohen demonstrates how adaptations of this doctrine reflected change in the self-consciousness of early medieval civilization. After exploring the effect of twelfth-century Europe's encounter with Islam on the value of Augustine's Jewish witnesses, he concludes with a new assessment of the reception of Augustine's ideas among thirteenth-century popes and friars. 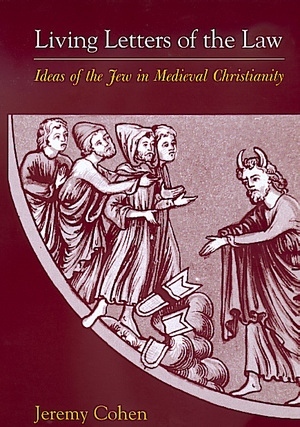 Consistently linking the medieval idea of the Jew with broader issues of textual criticism, anthropology, and the philosophy of history, this book demonstrates the complex significance of Christianity's "hermeneutical Jew" not only in the history of antisemitism but also in the broad scope of Western intellectual history. Jeremy Cohen, Professor of Medieval Jewish History at Tel Aviv University, has written two prize-winning books, The Friars and the Jews (1982), and "Be Fertile and Increase, Fill the Earth and Master It" (1989). He is the editor ofEssential Papers on Judaism and Christianity in Conflict (1991), and From Witness to Witchcraft: Jews and Judaism in Medieval Christian Thought (1996).